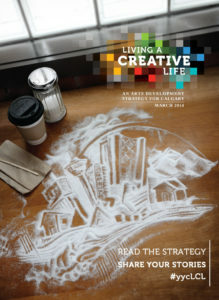 Vision: Calgary’s communities enjoy access to a rich spectrum of arts experiences. Outcome One: A wide variety of arts experiences are embedded in neighbourhoods across the city. Driver: Encourage the private, public, community and arts sectors to incorporate the arts into the daily lives of Calgarians in both purpose-built and alternative arts spaces. Create artist residency programs across all sectors and neighbourhoods. Broker connections between the arts and the private sector to encourage an arts presence in corporate and commercial space. Create incentives for artists and arts organizations to bring their work to neighbourhoods that currently have little or no arts presence. Increase understanding between permitting bodies and those seeking to create public arts experiences. Driver: Increase awareness within the arts community of opportunities to create and present work in neighbourhoods throughout Calgary, in both purpose-built and alternative arts spaces. Create a centralized agency or roster that connects artists, freelance arts educators, arts organizations, families and community groups to ease the process of bringing the arts into homes and communities. Create a city-wide inventory of available arts spaces, both purpose-built and alternative. Number of nights arts spaces are occupied. Number of arts events (classes, performances, exhibits, etc.) in the city. Percentage of arts events by on discipline. Percentage of Calgarians who volunteer in the arts. Percentage of Calgarians who attend arts events. Percentage of Calgarians who undertake a personal artistic practice. Percentage of Calgarians who engage with the arts through media consumption (watching TV, downloading music, reading magazines, etc.). Outcome Two: Calgarians’ arts participation and the arts sector itself are reflective of Calgary’s diversity, its inclusivity and the desire of Calgarians to learn more about one another. Driver: Encourage cross-cultural collaboration during the artistic process to create more diverse arts programming that will attract audiences from across the city. Work with the private, public and arts sectors to create and maintain opportunities to fund and promote citizen-led artistic initiatives. Encourage cross-cultural exchange and networking between arts organizations, artists and cultural groups. Driver: Increase support for Calgary-based artists who are new to Canada. Work with the private, public and arts sectors to create funding, promotion and recognition opportunities for new Canadian artists in Calgary. Ensure that new Canadian artists feel welcome in Calgary and are aware of opportunities for networking with the arts community. Driver: Diversify the range of cultural, social, geographic and economic voices within the arts community. Increase the dialogue about how arts organizations can diversify their boards of directors, staff and artists. Invite and encourage diverse populations to engage in arts-related public consultations or review processes. Percentage of arts engagement by race/ethnicity, age, geographic location and socio-economic status. Number of new Canadians making a living as an artist. Number of organizations that serve underrepresented or specific populations through the arts. Number of arts events in the city that intentionally serve diverse populations.